"This painting is a simple tribute to a wonderful racehorse depicting him on the most 'special day' of his racing career i.e. 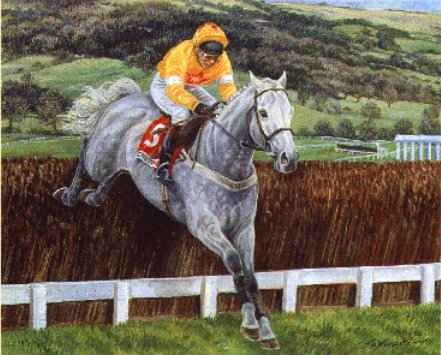 on his way to victory in the Queen Mother Champion Chase at the Cheltenham Festival in 1998. Fortunately, it was a beautiful day and I wanted to capture the backdrop of Cleeve Hill which provides such a marvellous setting for the racecourse, as well as One Man's springheeled jumping, for which he was so renowned. I have shown him landing well out over the final fence before sprinting up the hill to glory." This is the first in a series of limited edition prints featuring some of the most renowned racehorses to grace the turf in recent decades.